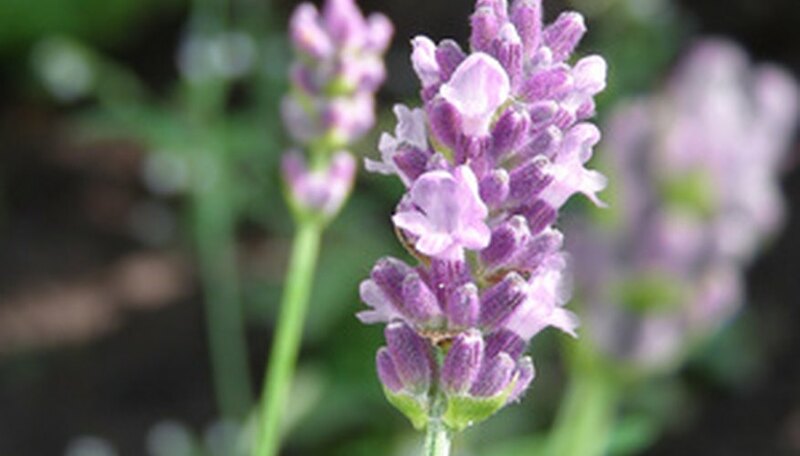 Growing lavender, genus "Lavandula," has become a popular cottage industry due to the plant's many uses. Under controlled growing conditions, the perennial herb has few insect or disease problems. However, lavender leaf fungus, Septoria lavandulae, sometimes referred to as Septoria leaf spot, can infect plants of the lavender family, including angustifolia varieties and lavendin hybrids, under certain weather related conditions. Septoria lavandulae appears near the edges of older leaves low on the plant or within shaded areas and looks like gray spots. The small size of the fungus requires growers to do a thorough examination of plants on a regular basis. As the fungus progresses, the spots enlarge and sometimes touch each other, forming large lesions with purple/brown borders. Lavender is best grown in areas with low humidity since repeated high humidity can germinate Septoria lavandulae spores and cause plant disease. In areas with warm temperatures and high humidity the fungus usually become problematic in late summer and fall, however, long stretches of wet weather in the spring and summer can cause early onset of the disease. The fungus can overwinter on lavender tissue; therefore, it can be spread any time during the growing season. Water makes the spore cases swell and once released the spores can be spread by wind, water splashes during rainstorms, irrigation, and people walking through the wet fields. Plants growing in close proximity can easily become victims of the disease. Septoria lavandulae often appears in greenhouse plants due to favorable growing conditions such as high humidity and overhead watering. Lavender leaf fungus can have a detrimental effect on plants, ranging from loss of leaves to a general weakening of the plant. This can inhibit growth and reduce flower and oil production. The disease has not been proven to alter the herb's healthy flowers in terms of odor or appearance. Prevention begins with site preparation and constant vigilance during wet and humid conditions. Reused plant trays and pots should be thoroughly cleaned and disinfected to eliminate any lingering fungus from previous plants. Plants should be sited to take advantage of air currents that increase ventilation in fields. Prior to planting, all lavender plants should be inspected to ensure the condition is not already present. New plants should be placed in a confined field away from existing plants. Restricting field access during prime fungus growth conditions can help curb the spread of the disease. Fungicides must be used prior to the appearance of the disease. By remedying conditions that caused the fungus to grow, plants will recover on their own.